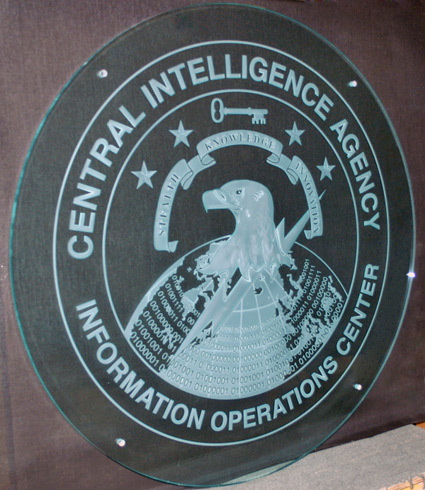 Classic Glass recently completed a carved glass sign for the Central Intelligence Agency’s Information Operations Center. This division of the CIA evaluates foreign threats to US computer systems, particularly those that support critical infrastructures. This particular carved glass sign is sculpted on glass that is 48″ in diameter and hung with aluminum standoffs. The technique is generally referred to as multi-stage deep carving; each area is literally sculpted by hand to create a dramatic depth effect. Carved glass can also be in-filled with paint or shaded with various etched densities to further add dimension. Classic Glass is often commissioned to produce carved glass signs for various government agencies around the Washington, DC area. Our state of the art technology and superior craftsmanship ensure exacting reproduction of logos and seals to be used as architectural signage. This entry was posted on Wednesday, June 9th, 2010 at 8:13 am	and is filed under Decorative Glass. You can follow any responses to this entry through the RSS 2.0 feed.Both comments and pings are currently closed.